Learn how to taste and evaluate a glass of wine like an expert by following our wine tasting tips. First step? Find out the right environment for tasting. First things first: Make note of the circumstances surrounding your wine tasting experience that may affect your impressions of the wine. For instance, a noisy or crowded room makes concentration difficult. Cooking smells, perfume and even pet odor can destroy your ability to get a clear sense of a wine’s aromas. A glass that is too small, the wrong shape, or smells of detergent or dust, can also affect the wine’s flavor. First, look straight down into the glass, then hold the glass to the light, and finally, give it a tilt, so the wine rolls toward its edges. This will allow you to see the wine’s complete color range, not just the dark center. Looking down, you get a sense of the depth of color, which gives a clue to the density and saturation of the wine. You will also learn to identify certain grapes by color and scent. 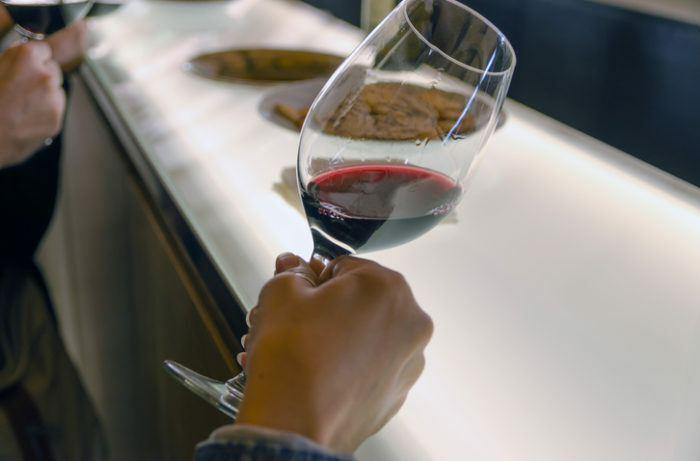 A deeply-saturated, purple-black color might well be Syrah or Zinfandel, while a lighter, pale brick shade would suggest Pinot Noir or Sangiovese. Floral aromas are particularly common in cool climate white wines like Riesling and Gewürztraminer, and some Rhône varieties, including Viognier. Now that you understand the basic steps with our wine tasting tips, it’s time to experiment on your own. It can be quite helpful to build a wine journal of your adventures. Write complete tasting notes for wines you like and dislike. Noting the characteristics that each wine shares will be immensely helpful as you start learning how to choose wine on your own. Cheers!